Secret Superstar is the big Diwali release of the year starring Aamir Khan (in extended cameo) and Zaira Wasim (of Dangal fame), Meher Vij and Raj Arjun. Film is one of the most anticipated film of the year. It is great to see Aamir and Zaira again coming back together after Dangal. Hope they creates History again at box office. Film is directed by first timer Advait Chandan and produced by Aamir Khan. 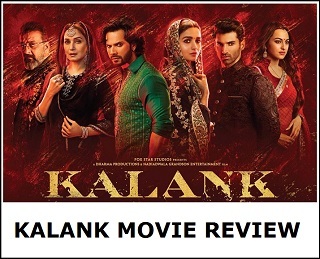 So, let's start the Movie Review. 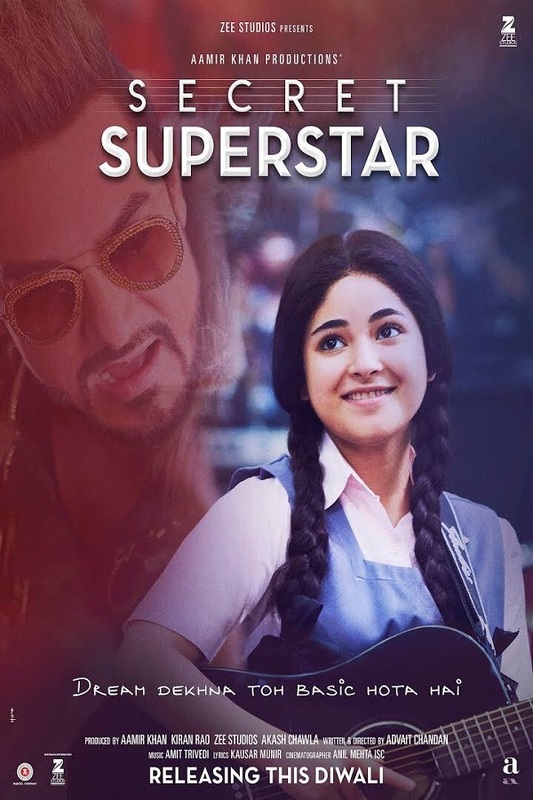 Story: Secret Superstar is a story of fifteen year old Insia (Zaira Wasim), who aspires to become a singer. However, her autocratic father (Raj Arjun) stands in the way of her great dream. Here comes her mother (Meher Vij) as savior and support system. From here on Insia journey to realise her dream begins. Under a mask of anonymity, she soon becomes an internet sensation, a 'Secret Superstar'. With the world in awe of Insia's rare singing talent and a self proclaimed and celebrated musician Sakti Kumar (Aamir Khan) mentoring and motivating her, she embarks on an exciting journey. Will she able to fulfill her dreams. Will she be able to become a renowned singer? What will her father's reaction and response, when he came to know about Insia secret identity and her dreams. For all these and rest of the story one has to go to theaters to watch the film. First half of the film is ok. Film starts on good note. However, in between pace of the film dips a bit. Screenplay in first half could have been tighter. But it is still good. 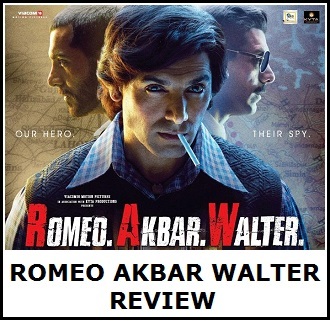 Film picks up pace as it nears the interval point. Good news is Second half of the film is fantastic. It is total roller coaster ride from here on. 2nd half screenplay is much tighter and better. Post interval it is all about human emotion and bonding. There are scenes which will make us laugh loud. There are also scenes which will move one to tears and make our eyes moist. Without giving any spoiler, there is an important airport scene near to climax. This scene is the highlight of the film for sure. Overall, it is the 2nd half and climax which makes Secret Superstar a great film to watch. Direction of Advait Chandan is fantastic. As a captain of the ship, he takes full control of the product in hand and delivers one of the finest movie of the year so far. Kudos to him. Performances: Zaira Wasim is a pro in the role of Insia. She plays the fifteen year old role of Insia with lot of aplomb. She is a star and definitely here to stay in coming years. Surprise package of Secret Superstar is Meher Vij in the role of Najma Malik. Meher is a revelation in the film. She gets a author backed role in SS and creates magic. Audience will simply fall in love with her character. Hope this talented actress gets more recognition and good roles in coming films. Now coming to darling of masses Mr. Aamir Khan. He is extremely psychic and hilarious to the core. Good news for all Aamir fans is that he has a significant 30-40 minute role in the film. Secret Superstar is incomplete without the character Sakti Kumar. Aamir is the 'Entertainment' package in the film. Rest star cast: Raj Arjun (as Insia's father), Tirth Sharma (as Insia's best friend) and others all does a first rated job in their respective roles. Verdict: Secret Superstar is motivating, inspiring, empowering and yet entertaining. It is one of those rare films which enlightens all. Film has a nice message. It says everyone should chase their unfulfilled dreams and give their best even against all odds. SS might take slow start at box office. It is also clashing with another biggie in Golmaal Again and it may take back seat in first few days. But there is no doubt it will gain momentum on power of word of mouth. Once, film picks up it might be unstoppable for atleast few weeks. Despite SS being a small film it has potential to collect 80-100 crore at box office and emerges a Super HIT! Ratings: 3.5/5. Recommended this Diwali. Definite watch for all those who belief in their dreams. Yes, "Dream Dekhna Toh Basic Hota Hai" after all!